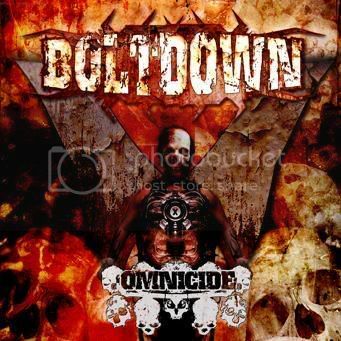 Formed in Newcastle-upon-Tyne in 2006 by members of local bands to create a regional super-group, metal band Boltdown release debut album ‘Omnicide’ through Hangmans Joke Records (which they’ve recently departed from) which features 10 tracks of metal/thrash attacks. In previous bands the members have collectively toured with the likes of Lostprophets, Dry Kill Logic, and The Gathering to name but a few, which clearly tells us that these guys have the experience to give us the goods. Opening, and popular MySpace track ‘Deadlock’ (which is also currently up for free download on their MySpace profile) shows us sheer aggression with an almost immediate breakdown and a blast of screams and roars from lead vocalist & guitarist Leigh Final. Even though the song contains very basic chords within it’s breakdowns, it doesn’t stop the track being as aggressive as it is. Acoustic and mellow track ‘Solitute’ is also present on this record, which is a common addition with a lot of metal albums on the scene at present, and something that has always been popular. Just take a look at Metallica‘s ‘Orion’. Not a big surprise, but definitley a soothing and moving track for fans to behold and just take a moment back to listen to. ‘Blind Faith’ opens with a continuous drum beat which is soon accompanied greatly by the face-grinding guitar riffs. Drummer Ant Smith soon picks up the pace and shows off his more skillful side, with an excellent offering of double-bass drum playing. Even the bass section is simple yet effective, this band just gets away with it. Even though Boltdown really know what they’re doing and make simple great music, what they play is nothing new and nothing that hasn’t been heard before. With a sound similar to the combined efforts of the likes of Metallica, Children Of Bodom, Machine Head, and Slayer, they have the breakdowns, the vocals, and the song progression to back this up. But, with all that aside, Boltdown are a metal band that are definitely worth listening to if that sort of stuff is your cup of tea. They do everything metal, and they do it all well. They have the right attitude and impression to pull it off; the past experience, the musicianship, the songwriting skills, the constant yet appropriate taboo language; all they need now is the right break. Boltdown are worth at least one listen by most generic metal fans. ‘Omnicide’ â€“ a simple yet great album by a young metal band.